We find this program helps reduce some of the stress that accompanies the first few months of college. First-year students have to manage their class schedule, learn their way around campus, and get to know their professors and classmates, among other adjustments. Adult learners also have the extra challenge of learning how to balance earning a degree with work and their personal life, so the FYI program is here to help. 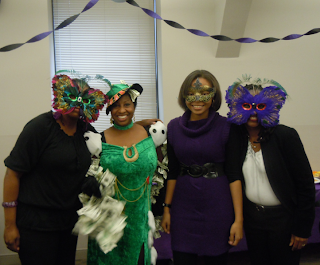 This year's masquerade party was a potluck, and we encouraged all attendees to dress up. Everyone looked great! We also gave all students some Halloween-themed goodies, and the first four lucky attendees received gift cards. It was an informal atmosphere, and students, faculty, and staff had the opportunity to speak one-on-one. We talked about the college transition, and some of the resources that are available to help students here at the College, including the Walker Center and Career Development Services. We also connected new students with ones who've been attending the College for two or more years. These more experienced students are informal mentors, and can answer questions about classes and school work new students might have. We created the FYI program to support students during their first 28 weeks at the College. But if you're past those 28 weeks and still want to participate in FYI activities, you're always welcome! More experienced students can share their advice about how to achieve the work-life-education balance, and set the example for how it can be done. If you want to participate in future FYI events, whether or not you're a first-year student, stay tuned to the Peirce portal for information on upcoming activities. We'll be posting our scholarship winners there, as well as here on the blog, when they're chosen. You can also email the team if you have any questions about the FYI program. I want to thank the FYI staff, who worked extremely hard to put this masquerade party together. You did a great job! And to our students, we can't wait to see you at a future FYI event!